Check your account page to see if you have any shopping rewards to redeem. The date stamped on the bottom of each bottle is the day your container was filled, NOT the expire date. Our Pure Emu Oil has a unique silky feel and excellent penetration qualities which set this Emu Oil apart from all others. 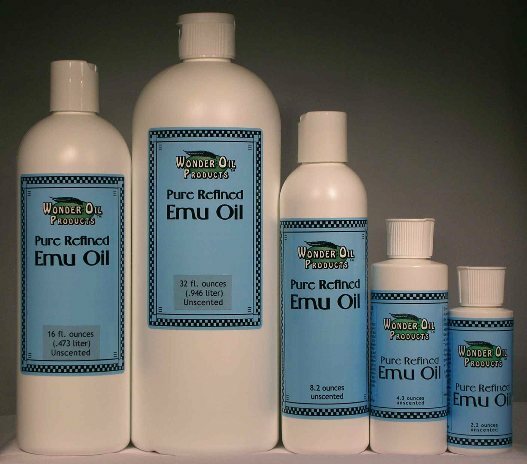 Emu Oil is the only natural oil that readily penetrates through the skin into the underlying tissues. It has been found to be particularly effective at moisturizing dry skin. Most find it helpful when applied to: eczema, rosacea, dermatitis, and psoriasis. It has been found to reduce soft tissue inflammation, quickly reduce the pain of burns and helps speed healing of any skin injury. Also softens wrinkles (especially around the eyes), prevents stretch marks and scarring and much more. Supported by numerous research and studies. All natural and odor free. Our Emu Oil does now and always has FAR exceeded the American Emu Association's emu oil minimum certification standards. 8.2 fluid ounces of our 100% Pure Emu Oil in a high density plastic bottle with a pop up dispenser cap. 16 fluid ounces of our 100% Pure Emu Oil in a high density plastic bottle with a pop up dispenser cap. 34 fluid ounces of our 100% Pure Emu Oil in a high density plastic bottle with a pop up dispenser cap. A FREE pump dispenser can be included if you wish. Include that in the "Special Instructions" box as well if you want one. One Gallon Pure Emu Oil, 128 fl. oz. PLEASE NOTE: THIS NOW SHIPS IN ONE SINGLE GALLON CONTAINER AND DOES NOT INCLUDE A PUMP DISPENSER SINCE IT DOESN'T FIT IN THE BOX WITH THE GALLON. PLEASE ORDER THE PUMP SEPARATELY AT THE SAME TIME IF YOU NEED ONE ($4.99). IT WILL SHIP SEPARATELY AND SHIPPING IS FREE IF ORDERED ALONG WITH THE GALLON. IT IS LISTED IN MISC. PRODUCTS. IT COSTS $4.99 AND LASTS A LONG TIME.